Share the post "The Work of Jack Frost"
She said that is how she can tell whether it’s cold or bitterly cold. I have a client who is secretly an angel living in Mason City who mentioned her concern about homeless people living here and wondering if they would have shelter. I most LOVE humans who can step out of themselves and become selfless. One of my relatives is without heat due to an aged furnace breaking down who’s at this time burning wood in a pot-bellied stove in his basement. I called him today to make sure everything is OK with his keeping warm. His new furnace will be installed tomorrow so hopefully all will be well. I worry more about people who are on fixed incomes and can’t seem keep up with the diminished value of the dollar. My wood-burning relative said something to me today that I will never forget. His comment was, “Why is it that people who have a great deal of money think everyone else should have the same?” Now that was a statement! In counter-balance on the positive side, I have a very dear and loving Mother whom I’ve grown to understand quite well. If any of us as children ever asked her for money, she would bristle and place us under hours of interrogation; but, if she believed someone was in need, she would give freely without question. That is the mark of a person who has learned how to step out one’s shoes and walk in another’s. 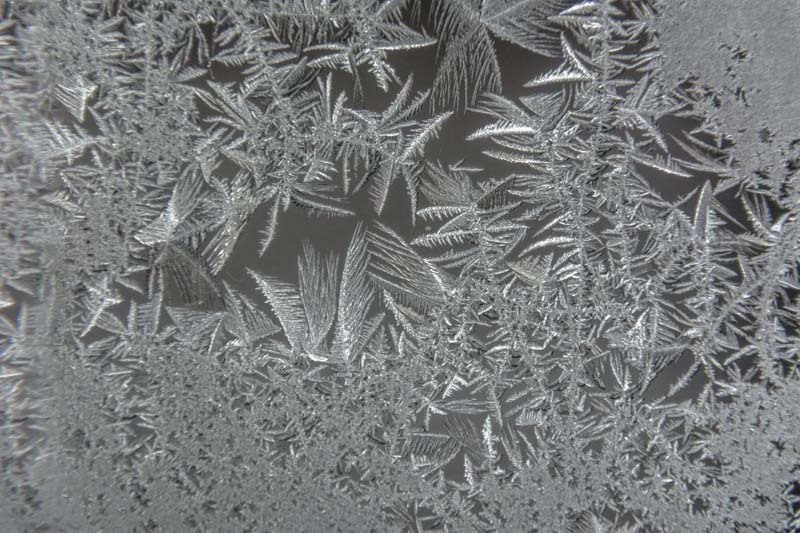 I managed to capture a photo of Jack Frost doing some of his artwork on a window today. How lovely, but how cold!